Helen Creighton was born into an old and distinguished Halifax family in 1899 in Dartmouth, Nova Scotia. She was born with a caul, a folkloric sign of good fortune. In the 1920s, she began to write travel pieces, fiction, and stories for the radio. Creighton began her career as a folk music collector in 1928. She started close to home, on the shores of Halifax Harbor. Her first book, Songs and Ballads from Nova Scotia, 1932, is based on these maiden efforts. When it was suggested to me by Dr. Henry Munro, Superintendent of Education for the province, that I look for ballads in my search for literary material within this coast of adventure and romance, I thought the possibility of finding any such songs very remote indeed. For which my ignorance pleads humble forgiveness. Yet be it said in defense that until the early summer of 1929 I had never heard a ballad sung in this my native province. 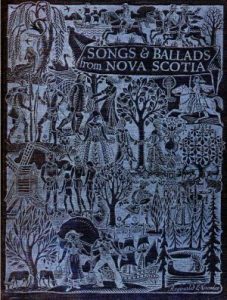 Notice the beauty of the front cover of Songs and Ballads of Nova Scotia, published by the Toronto firm of J. M. Dent and Sons in 1932. “What kind of songs?” we asked indifferently. “Pirate songs,” he said. Could it be possible that I was to find them at my very door? So I took the names of those most likely to sing, asked him to prepare them for my coming, and went away wondering what I was to find. Collecting can never be done in any hurry, as I discovered very soon. One or two visits were made in the day-time, when friendly contacts were established. But we soon saw that evening was the time for song. Evening, when the day’s work is done and the hour of relaxation has come. Evening, when the workaday world is at rest and all people feel a kindly sense of companionship towards one another. Helen Creighton, “Introduction,” Songs and Ballads from Nova Scotia. Toronto: J. M. Dent & Sons, 1932. In 1931 Creighton found a partner in her efforts; the English folklorist Doreen Senior. During the 1930s the pair traveled throughout Nova Scotia gathering folksongs. Creighton sought out the informants and recorded song lyrics, while Senior transcribed the music. Creighton and Senior published Twelve Folk Songs from Nova Scotia in 1941; and Traditional Songs from Nova Scotia in 1950.Creighton received a Rockefeller Foundation grant to attend the summer Institute of Folklore at Indiana University in 1942. She studied with Alan Lomax, Herbert Halpert, and others. She was the only one of the women in this exhibit to formally study folklore. This summer course gave Creighton exposure to the wide variety of materials which folklorists dealt with, and thus may have helped broaden her collecting interests. After her return from Indiana Creighton began seeking out more diverse informants, including African Nova Scotians, Mi’kmaqs, and Acadians. La Fleur de Rosier: Acadian Folksongs, 1989. P00264: Here, Creighton presents one of these awards to local singer James Brown. As usual, guests were gathered on Louise’s wonderful back porch with its panoramic view of the Miramichi . . . . but there was one person I didn’t recognize, a woman sitting off to one side who was putting in time before supper hemming a skirt. “And this is Helen Creighton,” Louise said, “She’s collected a thousand songs, and she’ll be judging with you.” Somehow I already knew that that’s who it was, although I’d never seen a picture of her, and I remember remarking to myself how often people you’ve looked up to as ancestor figures turn out to be just people. . . . But if anyone qualified as an ancestor figure for me in this folksong collecting game I had recently entered, it was Helen Creighton, and there she was, hemming a skirt. It seemed exactly right. Edward D. Ives, The World of Maritimes Folklore. Evergreen Booklets No. 1. Halifax: The Helen Creighton Foundation, 1993. Pages 1-3. P05790: Edward “Sandy” Ives and Helen Creighton. 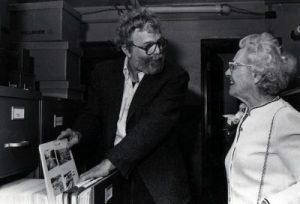 Edward D. “Sandy” Ives shows Helen Creighton some of the holdings of the Northeast Archives of Folklore and Oral History. Creighton visited the Archives during the 1982 annual meeting of the Northeast Folklore Society. 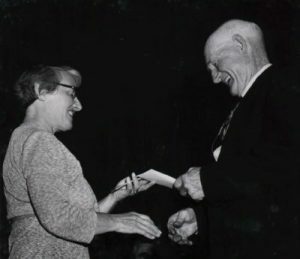 She was the guest of honor at this meeting, at which Ives presented her with a bundle of letters of appreciation and thanks from her colleagues in folklore.